MD in internal medicine from Calicut Medical College and DM in Medical oncology from Kidwai Memorial Institute of Oncology, Bangalore. Fellow of the Royal college of Physicians of London. 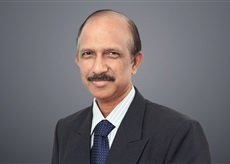 Had training in hematology from Royal Hallamshire hospital, Sheffield, United Kingdom and gained experience in Bone-marrow transplantation from Fred Hutchinson cancer centre, Seattle, USA.Currently working as Professor and Head of the Department of Medical Oncology and Hematology at Amrita Institute of Medical Sciences and Research Centre, Kochi, Kerala, India, since 2004.Member of many national (ISHTM, ISMPO, ISO, API) and international organizations (International Medical sciences Academy, International Society of Geriatric Oncology, European Society of Medical Oncology, International Network for Cancer treatment and Research (INCTR) and International society of gynecologic oncology.Has presented many papers and delivered many lectures at various national and international conferences. Has published 65 papers in International Journals and 82 in National journals. Edited two books on cancer and has contributed more than 37 chapters in various books. Participated in more than 25 clinical trials.